Fast reliable all inclusive quotes. You can depend on Asbestos Removal Sydney for the most comprehensive, professional asbestos removal service. We deliver a complete service from start to finish, which guarantees your peace of mind and safety during the entire process. Our expert team is well equipped with all necessary equipment to handle asbestos within residential areas. Moreover, we strictly abide by all legal requirements and observe the highest industry standards, which has enabled us deliver effective services to many home owners. 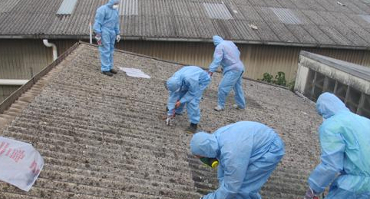 Our team of highly trained personnel is intimately aware of the potential risk of asbestos. You can hardly compare the removal of this substance to any other service. This is because mere exposure can lead to serious diseases such as pleural plaques, lung cancer, asbestosis and mesothelioma. Hence, we always employ stringent safety precautions during each removal exercise. In order to deliver a thorough service, the exact nature of the threat must be evaluated. Only then would it be possible to completely eliminate the potential risk. Our expert team always employs the highest industry-standard techniques, starting from this initial evaluation stage. We only make use of laboratories accredited by the National Association of Testing Authorities (NATA) in testing samples of materials derived from the removal site. Through this, the exact threat can be identified and targeted. Based on extensive knowledge, typical asbestos-containing areas can be assessed. 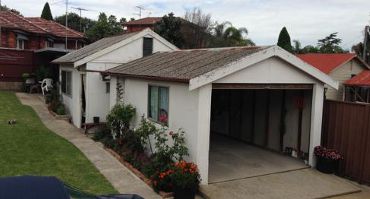 Indeed, bonded asbestos cement materials make up most of the likely asbestos-containing products within the house. These include roofing, exterior and interior wall cladding, shingles, siding, and eaves. Friable asbestos products may also be found in specific areas within the house, and they have greater potential for harm due to their ease of getting airborne. Some of the typical areas that would be assessed include: insulation on domestic heaters, stoves and hot-water pipes, soundproofing, spray-on insulation, and low-density asbestos fibre boards. Foreknowledge of such potential areas helps our removal team handle the identification process speedily and effectively. 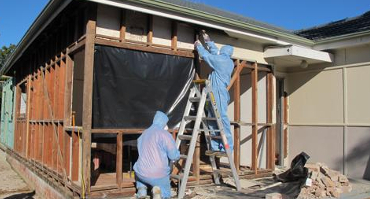 Asbestos Removal Sydney, a leading removal contractor, always handles each removal exercise professionally. Every step of the process complies with all regulatory requirements to ensure maximum safety and complete effectiveness. A clear outline of the entire exercise is always prepared beforehand, which rules out the chance of mistakes happening during the operation. This outline is documented in an asbestos removal control plan, a document that is a requirement of the WorkCover Authority. When carrying out the exercise, not only do we ensure safety of all workers on site, but we also apply ample measures for the safety of anyone nearby. The work area is always cordoned off using display signs and barricades. Only qualified professionals are allowed within the work area. Furthermore, it’s necessary that no contamination spreads to surrounding areas. For this reason, decontamination facilities would always be located within the work area. Just as the removal process begins with prior testing, so also will it end with tests to identify any contaminants in the air. This is done through air monitoring, as well as clearance inspections, which are particularly necessary when handling friable asbestos. The disposal process is just as important as the removal exercise. By observing industry-standard disposal methods, future contamination is prevented. The particular extent of asbestos risk would determine the duration of removal. Only after evaluating the asbestos containing materials would it be possible to determine the duration of the whole exercise. Fortunately, through a well-organized step-by-step process, it’s possible to complete the removal exercise within a limited time. By doing this, we ensure minimal interruptions to your daily activities within the home. Apart from the duration, the level of difficulty in handling different types of asbestos material would determine the overall cost. However, you can take advantage of Asbestos Removal Sydney’s efficient and fast removal process, which ensures the most affordable cost.